A method to immunostain and visualize chordotonal organs in larvae and pupae of Drosophila melanogaster is described. Halachmi, N., Nachman, A., Salzberg, A. Visualization of Proprioceptors in Drosophila Larvae and Pupae. J. Vis. Exp. (64), e3846, doi:10.3791/3846 (2012). Proprioception is the ability to sense the motion, or position, of body parts by responding to stimuli arising within the body. In fruitflies and other insects proprioception is provided by specialized sensory organs termed chordotonal organs (ChOs) 2. Like many other organs in Drosophila, ChOs develop twice during the life cycle of the fly. First, the larval ChOs develop during embryogenesis. Then, the adult ChOs start to develop in the larval imaginal discs and continue to differentiate during metamorphosis. The development of larval ChOs during embryogenesis has been studied extensively 10,11,13,15,16. The centerpiece of each ChO is a sensory unit composed of a neuron and a scolopale cell. The sensory unit is stretched between two types of accessory cells that attach to the cuticle via specialized epidermal attachment cells 1,9,14. When a fly larva moves, the relative displacement of the epidermal attachment cells leads to stretching of the sensory unit and consequent opening of specific transient receptor potential vanilloid (TRPV) channels at the outer segment of the dendrite 8,12. The elicited signal is then transferred to the locomotor central pattern generator circuit in the central nervous system. Multiple ChOs have been described in the adult fly 7. These are located near the joints of the adult fly appendages (legs, wings and halters) and in the thorax and abdomen. In addition, several hundreds of ChOs collectively form the Johnston's organ in the adult antenna that transduce acoustic to mechanical energy 3,5,17,4. In contrast to the extensive knowledge about the development of ChOs in embryonic stages, very little is known about the morphology of these organs during larval stages. Moreover, with the exception of femoral ChOs 18 and Johnston's organ, our knowledge about the development and structure of ChOs in the adult fly is very fragmentary. Here we describe a method for staining and visualizing ChOs in third instar larvae and pupae. This method can be applied together with genetic tools to better characterize the morphology and understand the development of the various ChOs in the fly. Grow the desired fly cultures. Keep the vials uncrowded (approximately 30 flies per 50 ml vial). Let the flies lay eggs for only one day in each vial. This will provide the larvae sufficient food supply and allow them to reach maximal size before crawling out of the food. Keep the vials in the appropriate temperature until third instar larvae begin to wander on the vial wall. Prepare a fresh stock of phosphate buffered saline (PBS) and PBT (0.1% Tween in PBS). Keep 10 ml of PBS on ice. Prepare 1-5 ml of fresh fixative (4% Formaldehyde in PBT) and keep it on ice. We use bottled 37-38% formaldehyde as a stock solution. Pick a wandering third instar larva from the vial wall and place it in a 50 μl drop of ice-cold PBS on a Sylgard dissection plate (made of Sylgard 184 silicone elastomer kit, DOW Corning Corporation in a tissue culture dish). Hold the larva, dorsal side up, near the mouth hooks, using fine forceps (Dumont #5 forceps), and stick an insect pin (minutien, 0.1 mm, stainless steel) through the larva's brain. Grab the posterior end of the larva with the forceps, pull gently and stretch the larva gently lengthwise. Stick another insect pin between the two posterior spiracles. Using spring scissors cut two horizontal incisions in the body wall (perpendicular to the anterior-posterior axis), close to the anterior and posterior pins. Using the spring scissors cut the larval body wall along the dorsal midline from the anterior to the posterior incision. Remove internal organs (gut, salivary glands, malpighian tubules etc.) and the trachea using fine forceps. Wash gently once or twice with PBS. Grab the two body wall flaps with forceps, stretch them out and pin them to the plate using two insect pins for each side. Remove the PBS and add 50 μl of fixing solution (4% formaldehyde in PBT). Incubate 20 minutes at room temperature. Remove the fixative. Wash twice with PBS. Pull out the insect pins. Using spring scissors cut the larval head and tail leaving a rectangular fillet. Transfer the fixed tissue to a chilled Eppendorf tube with PBS. Once a sufficient number of larvae are fixed, one can continue directly to antibody staining. If immediate staining is not desired, the fixed larvae should be washed 3 times, 5 minutes each, with 95% ethanol and stored in 95% ethanol at -20 °C. Attend to the vials as for larvae fixation, until third instar larvae begin to pupariate. Examine the vials every hour and mark larvae that have pupariated. Allow the marked pupae to develop 30-40 hours at 24 °C, or 24-27 hours at 29 °C. Using fine forceps pick 20-30 pupae of the appropriate age and put them in a dark porcelain multi-well dissecting dish. Be careful not to damage the tissues of interest. Extract the pupae from the pupal case. Begin by peeling off the operculum and continue until the pupa is free. Put the pupa into a well filled with PBT. Continue extracting all the pupae. Steps 2.4-2.6 should be done in small batches of five pupae at a time. Place five pupae on a flat surface between the wells of the dissecting dish. Using a micro dissection knife cut the tip of the head and the posterior tip of the abdomen (alternatively, it is possible to use two pairs of forceps to tear holes at both ends of the pupae). Hold the pupa in place using fine forceps and use a 1 ml syringe to wash out the internal organs of the pupa, by injecting PBT through the anterior opening. Wash the dissected pupa briefly by dipping it in a well filled with PBS and move it into the cold fixative in an Eppendorf tube kept on ice. Incubate overnight (ON) at 4 °C. Discard the fixative and wash the pupae three times, 5 minutes each, with PBT. Keep the washed pupae on ice. Fill two wells of the dissecting dish with PBT. Using a polyethylene Pasteur pipette transfer several pupae to one of the wells. Move one pupa at a time into the second well. Using two pairs of sharp forceps with perfectly aligned tips, peel off the transparent pupal cuticle of the wing: secure the pupa to the bottom of the well using one pair of forceps, and gently tear the cuticle using the second pair of forceps. Once the cuticle is torn, peel it off the wing. Be careful not to disconnect the wing from the pupa. After peeling off the cuticle from the wing blade, continue peeling the cuticle of the wing hinge (where the wing ChOs are located). After peeling off the wing cuticle, one can attempt peeling off the leg cuticle in a similar manner. Many legs are likely to be lost in the process, but despite the low yield, this step is highly recommended since it greatly improves the staining of leg ChOs. The ChOs of the haltere and abdomen can be visualized without further peeling off the cuticle. Place the 'peeled' pupa in an Eppendorf tube filled with methanol and keep at room temperature. Continue peeling off the cuticle of all the pupae, and add them to the same tube. At least 10 nicely peeled pupae should be collected for each staining. Remove the methanol and wash three times, 5 minutes each, with 95% Ethanol. Fixed pupae can be kept for long periods of time in 95% Ethanol at -20 °C. Wash the fixed tissue with PBT three times, 30 minutes each, at room temperature. Larvae can be washed with gentle shaking on a rotating plate. Pupae are washed without shaking. Replace the PBT with blocking buffer (PBT + 5% normal goat serum) and incubate ON at 4 °C. Remove the Blocking buffer and incubate with primary antibodies (diluted in blocking buffer) ON at 4 °C. Wash four times with PBT as described in step 3.1. Remove the PBT and incubate with secondary antibodies (diluted in blocking buffer) ON at 4 °C. Wash twice with PBT and once with PBS as described in step 3.1. Replace the PBS with mounting medium (Dako Fluorescent Mounting Medium (Dako Cytomation, Glostrup, Denmark) and incubate at 4 °C ON. Larvae are mounted on a microscope slide in a drop of mounting media with their cuticle facing down and body wall muscles facing up. Put a small drop of mounting medium on a clean cover slip and use it to cover the preparation. Do not apply any pressure on the mounted larvae. Prepare two microscope slides with a drop of mounting medium, one for dissection and the second for mounting. Put several pupae on one of the slides. Using spring scissors remove the head and the posterior part of the abdomen. Separate the dorsal half of the thorax from the ventral half by cutting between the wings and the legs. Place the dissected body parts of the pupa on the second microscope slide in a drop of mounting solution. Ensure that the wings and legs are stretched out and try to minimize overlaying of tissues as much as possible. Place a drop of mounting medium on a cover slip and place it over the sample. Do not apply pressure on the mounted sample. An example of immuno-stained ChOs of third instar larva is shown in Figure 1. This example shows a nicely stretched abdominal segment in which seven of the eight ChOs are clearly visible. Neurons are labeled with MAb22C10 (1:20, obtained from the Developmental Studies Hybridoma Bank at the University of Iowa); the cap, ligament, cap-attachment and ligament attachment cells are labeled with anti-αTub85E (1:10, Klein et al., 2010). Secondary antibodies for fluorescent staining were Cy3, or Cy5-conjugated anti-mouse/rabbit (1:200, Jackson Immunoresearch Laboratories). Samples were viewed using confocal microscopy (LSM 510, Zeiss). A cluster of wing ChOs at the ventral radial vein of a 35 hr-old pupa is shown in Figure 2. Figure 1. 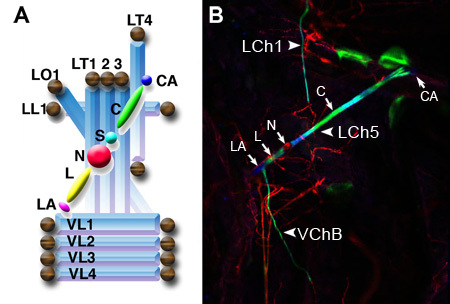 (A) Schematic illustration of the six cell types that constitute a single Ch organ: cap attachment (CA), cap (C), scolopale (S), neuron (N), ligament (L) and ligament attachment (LA). The LCh5 organ, in which five ChOs are clustered, is stretched across the group of lateral transverse muscles (LT1-4). The lateral longitudinal muscle (LL1), ventral longitudinal muscles (VL1-4) and lateral oblique muscle (LO1) are also illustrated. Tendon cells are illustrated as brown spheres (Taken from Klein et al., 2010). (B) One abdominal segment of a third instar larva viewed at a 10X magnification. Seven of the eight ChOs present in each abdominal segment are evident: five lateral organs that together form the pentascolopidial organ (LCh5), a single lateral organ (LCh1) and one of two ventral ChOs (VChB). The neurons (N) of the ChOs are labeled with the neuronal marker MAb 22C10 (red). The ligament (L), cap (C) and attachment cells (LA, CA) are labeled with anti-αTub-85E (blue). The cap and ligament cells are additionally labeled with a ChO-specific GFP reporter harboring a regulatory element from the dei locus (Nachman et al., unpublished data). Figure 2. The wing chordotonal organs at the ventral radial vein are viewed at a 40X magnification. The neurons (N) are marked with the neuronal marker 22C10 (Red, B). The ligament (L) and cap (C) cells are co-labeled with anti-αTub85E antibodies (Blue, C) and a ChO-specific GFP reporter transgene (Nachman et al., unpublished data). The protocol described in this video provides a way to visualize proprioceptive ChOs during larval and pupal stages. Studies about the structure and development of proprioceptive ChOs have been so far restricted mainly to embryonic stages and to larval imaginal discs. Thus, many aspects of later stages of development, of both larval and adult ChOs, remain largely unknown. The described protocol, combined with common genetic tools in Drosophila, can be utilized to identify and study new genes and pathways that play a role in later stages of ChOs development. This protocol was optimized for the visualization of ChO, but it can be adapted for the staining of other tissues, such as pupal wings 6. The authors would like to thank the Developmental Studies Hybridoma Bank at the University of Iowa for sending us antibodies. This work was supported by a grant (No. 29/08) from The Israel Science Foundation. A.S. is also supported by a research grant from the DFG (Deutsche Forschungsgemeinschaft). Vannas micro scissors (straight, 7.5 cm, blade 3mm) AS Mdeizintechnik GmbH 11-590-00 Vannas Spring Scissors with identical specifications can be purchased from Roboz Surgical Instrument Co.
Brewster, R., Bodmer, R. Origin and specification of type II sensory neurons in Drosophila. Development. 121, 2923-2936 (1995). Caldwell, J. C., Miller, M. M., Wing, S., Soll, D. R., Eberl, D. F. Dynamic analysis of larval locomotion in Drosophila chordotonal organ mutants. Proc. Natl. Acad. Sci. U.S.A. 100, 16053-16053 (2003). Eberl, D. F. Feeling the vibes: chordotonal mechanisms in insect hearing. Curr. Opin. Neurobiol. 9, 389-393 (1999). Eberl, D. F., Boekhoff-Falk, G. Development of Johnston's organ in Drosophila. Int. J. Dev. Biol. 51, 679-687 (2007). Eberl, D. F., Hardy, R. W., Kernan, M. J. Genetically similar transduction mechanisms for touch and hearing in Drosophila. J. Neurosci. 20, 5981-5988 (2000). Egoz-Matia, N., Nachman, A., Halachmi, N., Toder, M., Klein, Y., Salzberg, A. Spatial regulation of cell adhesion in the Drosophila wing is mediated by Delilah, a potent activator of βPS integrin expression. Dev Biol. 351, 99-109 (2011). Field, L. H., Matheson, T. Chordotonal organs of insects. Advances in Insect Physiology. 27, 1-228 (1998). Gong, Z., Son, W., Chung, Y. D., Kim, J., Shin, D. W., McClung, C. A., Lee, Y., Lee, H. W., Chang, D. J., Kaang, B. K. Two interdependent TRPV channel subunits, inactive and Nanchung, mediate hearing in Drosophila. J. Neurosci. 24, 9059-9066 (2004). Inbal, A., Volk, T., Salzberg, A. Recruitment of ectodermal attachment cells via an EGFR-dependent mechanism during the organogenesis of Drosophila proprioceptors. Dev. Cell. 7, 241-250 (2004). Jarman, A. P., Grau, Y., Jan, L. Y., Jan, Y. N. atonal is a proneural gene that directs chordotonal organ formation in the Drosophila peripheral nervous system. Cell. 73, 1307-1321 (1993). Jarman, A. P., Sun, Y., Jan, L. Y., Jan, Y. N. Role of the proneural gene, atonal, in formation of Drosophila chordotonal organs and photoreceptors. Development. 121, 2019-2030 (1995). Kim, J., Chung, Y. D., Park, D. Y., Choi, S., Shin, D. W., Soh, H., Lee, H. W., Son, W., Yim, J., Park, C. S. A TRPV family ion channel required for hearing in Drosophila. Nature. 424, 81-84 (2003). Klein, Y., Halachmi, N., Egoz-Matia, N., Toder, M., Salzberg, A. The proprioceptive and contractile systems in Drosophila are both patterned by the EGR family transcription factor Stripe. Dev. Biol. 337, 458-470 (2010). Matthews, K. A., Miller, D. F., Kaufman, T. C. Functional implications of the unusual spatial distribution of a minor alpha-tubulin isotype in Drosophila: a common thread among chordotonal ligaments, developing muscle, and testis cyst cells. Dev. Biol. 137, 171-183 (1990). Okabe, M., Okano, H. Two-step induction of chordotonal organ precursors in Drosophila embryogenesis. Development. 124, 1045-1053 (1997). Rusten, T. E., Cantera, R., Urban, J., Technau, G., Kafatos, F. C., Barrio, R. Spalt modifies EGFR-mediated induction of chordotonal precursors in the embryonic PNS of Drosophila promoting the development of oenocytes. Development. 128, 711-722 (2001). Todi, S. V., Sharma, Y., Eberl, D. F. Anatomical and molecular design of the Drosophila antenna as a flagellar auditory organ. Microsc. Res. Tech. 63, 388-399 (2004). zur Lage, P., Jarman, A. P. Antagonism of EGFR and notch signalling in the reiterative recruitment of Drosophila adult chordotonal sense organ precursors. Development. 126, 3149-3159 (1999).